Milton is a city in Santa Rosa County, Florida, United States. The city was incorporated in 1844 and is home to Naval Air Station Whiting Field. It is the county seat of Santa Rosa County. Milton was settled in the early 1800s as a small village centered on the lumber industry. The settlement was originally known as "Scratch Ankle", because of the briars and bramble that grew in the area. Another name was "Jernigan's Landing", after Benjamin Jernigan (died April 1847), who built a water-powered saw mill at what is now Locklin Lake between 1828 and 1830. Other names were "Lumberton", "Black Water" and "Hard Scrabble", but by 1839, it was being referred to as "Milltown". 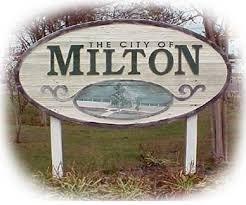 Milton was incorporated as a city in 1844, one year before the Territory of Florida joined the United States as the 27th state. During the Civil War, much of Milton was burned by Confederate forces retreating from the Union capture of Pensacola in May 1862. The Confederates intended to prevent the town's industries from falling into Union hands. After the Southern forces evacuated the Union troops had a small garrison in nearby Bagdad where they had a base for expeditions in the surrounding area. 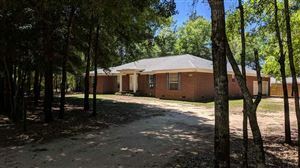 Many Milton residents fled to Alabama. Naval Air Station Whiting Field was constructed during World War II with the help of many German prisoners of war who were housed in a camp on the site. The station was commissioned on July 16, 1943 by Rear Admiral George D. Murray and the widow of Captain Kenneth Whiting, after whom the station was named. On March 31, 1962, an F3 tornado hit the northwest side of Milton, causing 17 deaths and 100 injuries. It was Florida's deadliest tornado until February 22, 1998, when 25 people were killed in Kissimmee. It was also the deadliest tornado in 1962.